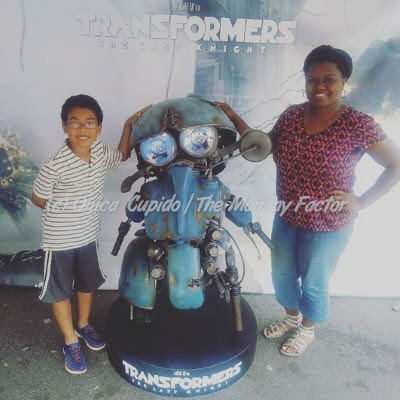 This past weekend we got up close and personal with an autobot. We met Sqweeks from TRANSFORMERS: THE LAST KNIGHT! And it was amazing! Well I did blog about Sqweeks going on tour and it so happens this past weekend he stopped in NYC. Of course we had to be there. We tried to get some insider info about what happens in TRANSFORMERS: THE LAST KNIGHT but Sqweeks was hush hush. But he did take time to take a photo with us. He's a cool bot. If Sqweeks tour brings him to where you live, make sure to come out and meet him. But if the tour doesn't stop in your area don't worry, there's another cool opportunity for you to get in on the fun. Paramount Pictures announced that exclusive OPTIMUS PRIME TIME opening night events for Michael Bay’s TRANSFORMERS: THE LAST KNIGHT will be held across the U.S. on Tuesday, June 20, 2017, at 7:00 p.m. local time at participating theaters. Moviegoers will be the first audiences in the world to see the highly anticipated film in the highest quality IMAX® 3D and select REALD 3D premium large format theatres across the country. Ticketholders at these events will receive exclusive collector’s edition TRANSFORMERS: THE LAST KNIGHT Prime Time t-shirts or other promotional items while supplies last at each participating theatre, subject to additional restrictions. Director Michael Bay, who shot TRANSFORMERS: THE LAST KNIGHT in native 3D and filmed with IMAX® cameras, will bring to theaters later this month a film that shatters the core myths of the Transformers franchise, and redefines what it means to be a hero. TRANSFORMERS: THE LAST KNIGHT opens nationwide on June 21, 2017.